GreenWorks 25322 G-MAX 40V — very affordable and well-engineered. What’s the best lawn mower for you? There are a lot of things to consider when purchasing a lawn mower so we decided to write a comprehensive guide to help you make the right buying decision. If you’re going to spend the money then it makes sense to buy a lawn mower that will handle the size of lawn you have for years to come. Later in the article we provide you with a list of some of the best lawn mowers currently on the market, including options for all power types — gas, electric, battery and push reel mowers. And, we give you some options if you need a lawn tractor (riding lawn mower) for large lawns or if you have some extra money and want to make mowing the lawn a lot more fun. We hope you find this lawn mower guide useful. Do you need a riding mower? How big is your yard? Your lawn is a representation of you. A lawn that is well-kept is one that is regularly mowed and adds curb appeal to your home as well as boosts property value. It shows that you take pride and consideration in keeping it looking its best and in order to keep it that way you need the best lawn mower. Have you ever passed through a neighborhood with neatly kept lawns and noticed one that was overgrown and strewn with weeds? It sticks out and attracts the wrong kind of attention. Many people think bigger is better and that when it comes to lawn mowers a higher-torque engine or a higher price equals better quality. This actually isn’t the case as some mowers might not be right for the job. Moreover, you don’t have to shell out a fortune to get the best lawn mower for your lawn-keeping needs either. You’ll find that over time, you will be saving a lot more money by caring for your own lawn as opposed to hiring a service. So, what kind of mower do you need? To a new homeowner making the right decision for the best lawn mower can be quite bewildering when faced with so many different choices. The right lawn mower is one that is practical for your needs. You wouldn’t use garden shears to cut a measly piece of paper so why get a high-powered lawn mower for a small lot of land? You need to have the right tools to perform the job at hand. When you are comparing mowers to determine the best buy there are several factors that need to be taken into consideration. For instance, let’s say you have a small lot of land in the suburbs with very few obstacles to maneuver around. A smaller sized push mower would be sufficient. Perhaps you live out in the country with just over an acre of land that has several slopes to go over. For this type of job you would want a machine that’s more efficient. Let’s face it, mowing grass isn’t the most exciting activity to perform. Having the right mower for your lawn should make the task much easier and more efficient. Different types of mowers will have different functions and features and they each offer their own advantages as well as disadvantages over another. Here’s a look at the different options you’ll come across when shopping around. Sometimes referred to as walk-behind mowers, the models in this category require more footwork on the user. A traditional push mower is the more economical choice in the lineup for lawn mowers with the manual-reel mowers on the lower end of the range starting at just $80. Push mowers are compact and take up less room than other types of mowers, which makes them ideal if you don’t have much storage space or you need to transport them. If you don’t mind getting in exercise and have a smaller yard under an acre this may be a sensible choice for budget-minded homeowners. 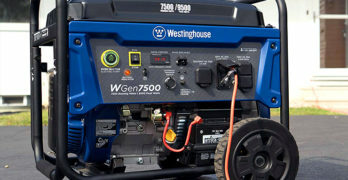 They come in different power options including manual reel mowers, electric(corded or battery-operated), and gas-powered. Reel mowers are not very common because they don’t produce the power and performance of those with an engine. However, if you have a small patch of grass to trim then this manual-reel mower might be all you really need. It’s designed with more ruggedness than most reel-mowers with StaySharp blades that are capable of cutting through thick, tough spots. They also have longer-lasting quality so there’s no need to pay for having the blades sharpened regularly. The discharge chute system throws grass clippings forward as you cut through for a clean cut that keeps grass clear from your feet. The height setting of the blades can be adjusted to trim grass from 1 to 4 inches thick and can even cut through twigs and tough weeds. Electric mowers are powered by an electric motor between 24- 40 volts and come in corded and cordless models. What’s nice about electric is that the motor doesn’t put out any harmful exhaust emissions making them the more eco-friendly choice. They’re also much quieter than gas engines so you’re less likely to disturb the neighbors and very easy to start with just the push of a button. There is very little upkeep required with maintaining electric mowers aside from needing to re-sharpen the blades occasionally. These lawn mowers typically have a cutting width of 14-21 inches and are most suitable if your yard is level and relatively small. Multiple Speed Options: Most mowers offer variable speed options from 1 MPH up to 3 ½ MPH. When choosing a model look for one that is equipped with a lever control or handlebar that allows you to adjust the speed without having to shift. Grass Clipping Discharge Modes: Some mowers come with multiple mode change options to bag or mulch grass clippings, or feature a side-discharge chute to disperse clippings back into the soil. Look for one that features mode changes without needing special tools for greater versatility. Handlebar Clutch: On push mowers, most are equipped with a blade brake clutch on the handlebar that will stop the mower’s blade when released without shutting off the entire unit. This makes stopping and starting easier for breaks such as moving an obstruction from your path without the need to restart the mower. One-Lever Height Adjustment: For adjusting the height of the mower’s deck, some push mowers feature a single lever option that will raise or lower the deck to the desired height preference. If you want to save time from having to adjust all four wheels of the mower then this feature is a must. Uniform Wheel Size: Some mowers will feature larger rear wheels from the front wheels. These are good for mowing a yard that is more rugged, however they’re not as easy to handle. Push mowers with front and rear wheels that are all the same size or relatively similar in size are easier to tilt back when turning at the end of a row. The corded electric lawn mowers are lightweight in comparison to other models, making them more convenient to store when not in use. Sun Joe is a popular brand among these models. Futuristic design and a long history of customer satisfaction. This model also comes in a larger 17-inch size and with a little more power (13 Amp) : Sun Joe MJ403E — We’ll discuss the differences later. Powered by a 12-amp motor, this compact sized mower is designed for use with a 14-gauge outdoor extension cord. To start it you just push the start-up button and there is a safety lock-off button feature that prevents the mower from becoming accidentally switched on. The durable steel blade cuts a path up to 14-inches wide and has 3 height adjustment manual settings to cut grass up to 2.4 inches deep. This mower features a hard-top rear bag to collect grass clippings that becomes easily detached for disposing. The detachable bag also offers a more compact design to make storing the unit in a small shed simple in addition to a collapsible handle. If you have trees or other obstacles in the yard to mow around then a battery-operated model would be more suitable than a corded electric model. These give you more freedom from being held back by a chord so you don’t have to worry about the square footage of your yard. They’re operated by a battery, typically rechargeable Lithium-ion, and usually will run for at least 30 minutes or longer. Although the batteries can be recharged for use after use they will eventually need replacing every 3 to 5 years. To prolong the life of your batteries be sure to read the user manual on recommendations for upkeep – for instance, most manufacturers advise not to leave the battery in the charger once it’s fully charged. The Greenworks series has several popular models to choose from and also feature rechargeable Lithium-Ion batteries that can be interchangeable with some of their other battery-operated products. Twin blades give this fantastic lawn mower an advantage. This model is the number one seller in the G-Max line-up of battery-operated mowers. The unique battery system features two 40V Li-Ion rechargeable batteries with an automatic switch over to switch power to the second battery once the first one is drained. A red indicator light lets you know which battery is in use. It has a total run-time of up to 60 minutes, although this will vary based on the condition of the grass. Suitable for cutting through a mid-sized yard, the twin 10-in blades cut a path up to 20-inches wide. There are 5 different height positions that allow you to adjust the cutting depth from 1 ¼ inches to 3 ⅛ inches. This unit features mulching capabilities with a rear-bag system to collect the grass clippings that can be used to fertilize your lawn as it decomposes. GreenWorks knows how to provide a lot of value for customers. Similar to the Twin Force model, this battery-operated mower also features a 40V Li-Ion battery system that includes two batteries as well as the charger. The 19-inch cutting deck offers efficient performance to get the job done and features 7 different height position adjustments to tailor specifically to the condition of your lawn. The 10-inch rear wheels and 7-inch front wheels offer easy maneuverability for pushing the unit on rugged lawns. This model has a 3-in-1 feature for disposing of the grass clippings. It mulches, features a rear-bag system, and it also has a side discharge chute to give you different options. When not in use, the handle folds down for a more compact design. The smallest of the GreenWorks G-MAX series. Great for small lawns. Suitable for smaller yards (less than ¼ acre) this model comes with one 40V Li-Ion 4Ah battery as well as the charger. On a full charge it has an approximate run time of up to 60 minutes and cuts an area of up to 7,000 square feet. It features the same smart cut technology that automatically adjusts the power of the mower based on the density of the grass and 5 lever-adjustable height positions from 1 ¼ inch to 3 ⅜ inches. The 2-in-1 system features mulching capability and a rear-bag system for versatile options. At just a little over 37 pounds, it is the lightest model in the G-Max series, with a fold-down handle for easier storage and transporting. 80V of battery power. Fantastic design and ultra-convenient for homeowners. Now if you’re looking for more rugged power capability with the convenience of low maintenance then this bad boy may be more up to speed for small to medium sized yards. The 80-volt lawn mower is the most powerful battery-operated unit of its kind (the battery and charger are sold separately) that delivers the equivalent power and performance to that of gas-powered models. It features a brushless motor with DigiPro Technology to give you the maximum power and performance the industry has to offer for tackling various types of grass (thick, damp, etc.). Simply put, it delivers fast and quiet operation to get the job done. The 21-inch steel deck features 3-in-1 cutting modes with mulching capabilities, a side discharge chute, and a large rear-bag system. Battery lasts up to 45 minutes — long enough for the average lawn. The 56V Lithium-Ion battery of this mower offers 45 minutes of run time and includes a rapid charger for fast charging in as little as 30 minutes. It also features a 3-in-1 system for mulching, bagging, or using the side chute for disposing grass clippings. This lawn mower has a neat unique compact fold feature so the handlebar folds all the way down and can be stored upright, unlike any other mower of its kind. The 20” weather-resistant deck offers better durability for long lasting quality that won’t rust. It also features LED headlights for better visibility to mow in the evening or early morning. Easy to store in the off-season. Easily accessible lever for changing the grass height lever. Gas powered lawn mowers are known for their power and most are self-propelled which makes them easier to handle and maneuver through tough grass or yards with steep slopes. These have a cutting width of 21 – 61 inches giving you a wider cut for fewer passes. So if your yard has gotten a little wild and weeds have taken over then gas powered are the best lawn mowers for the job. The gas-powered engines do have their drawbacks. They are much heavier than those that run on electricity or battery ranging between 62-250 pounds. These engines require some maintenance including regular tune-ups and oil changes at least once a year in order to keep them in top performance. They’re also louder than electric, so this is something you may want to keep in mind if you live in close proximity to your neighbors. Special caution should be taken with gas-powered mowers. Hearing protection is recommended while operating to prevent hearing loss. Because these engines put out exhaust emissions never start your gas-powered lawn mower in an enclosed space such as a garage or storage building. If you’re thinking a gas-powered option offers the best lawn mower for your needs consider some of these features that come standard with most gas engines. Premium Engine: gas-powered engines will have either overhead valves or a side-valve. For longer lasting quality, the overhead valve engines perform more efficiently and will hold up better over time. Electric Start: This is usually standard on most gas-powered engines, but may be optional on some models. For easier starting without a pull string look for models that come with an electric start feature. Rear-clippings bag: For gas or electric push mowers that feature a bagging mode, opt for one that has a rear-clippings bag. Rear bags hold a greater volume of grass clippings which means less frequent emptying and are also easier to maneuver than side-clipping bags. Foldable Handlebar: For optimizing space, many push mowers feature a handlebar that can be folded down for more compact storing or transporting to multiple locations. Husqvarna can do no wrong. This is no exception. Powered by a Honda GVC160 engine, this gas-powered mower delivers smooth performance that’s efficient to cut smaller yards. There are 4 height adjustments that can be set to cut grass in 6 different increments from 1 ½ inches to 3 ½ inches. There’s also a 3-in-1 system to bag, mulch, or disperse clippings from a side-discharge chute. This mower has features that offer convenience and ease of use to take on uneven terrains with 12-inch rear wheels that allow for easier maneuverability around obstacles. The handle folds down for a compact fold that gives it a unique space-saving feature for easy storage and transport. Riding lawn mowers, sometimes referred to as lawn tractors, are suitable options for larger yards that are a half-acre or larger or for those who just prefer the convenience of a riding mower opposed to a walk-behind. These generally have a clearing swath that is twice as wide as push mowers and operate at different speeds up to 13 MPH max. The drawbacks with these is that they are much larger and require more space to store them in. They’re also more expensive than push mowers and can cost upwards of $2,000 or more; although, you can find quality inexpensive models that will do just fine such as the Troy-Bilt TB30R that’s mentioned here. Automatic Drive System: Some lawn tractors have a system called a hydrostatic transmission or other system that allows the mower to instantly switch the ground speed without having to make manual gear shifts. This delivers more consistency without having to pause to switch gears. Fuel Tank Sight: Having a visual of the gas level in your lawn tractor will help take the guesswork out of determining how much gas you have to run on. Look for models that feature a fuel tank window sight or a fuel gauge to avoid running out of gas while mowing. Hour Meter: Because gas-powered engines require regular maintenance, keeping track of oil changes is important. Some riding lawn mower models now feature a meter that indicates how long it’s been since the last oil change or tune-up. A great combination of price, quality and size. The ultimate in convenience. When you need something that will work on a small to medium sized yard and at a relatively low price then look no further than right here. The compact size of this mower combines the efficiency of a riding mower with the convenience of a walk-behind mower to get around obstacles in the yard. The Troy-bilt 420cc engine on this unit has a 6-speed transmission with a top speed of just over 4MPH. Its 30-in. deck makes this lawn tractor smaller than the average lawn tractor and an ideal size for getting where larger mowers cannot with an 18-in. turning radius. Additional convenient features this mower has to offer include a sight window on the 1.3 gallon fuel tank to gauge the level of gas. The steering column can be adjusted to suit height preference for rider’s comfort along a soft-grip steering wheel and a mid-back seat. There’s even a cup holder built-in so you can keep your favorite (non-alcoholic) drink on hand. For large yards, this is the one you want to get. Comfort, power and quality. Widely known for their quality, Husqvarna lawn tractors give you a lot of bang for your buck. This one is equipped with a 24 HP Briggs and Stratton Twin V engine and a fast hydrostatic transmission that delivers incredibly smooth performance. One of its many interesting features is that it comes with cruise control so whether you’re on smooth or rough terrain you can set it to stay at a consistent speed. A 3 gallon fuel tank allows you to cut up to approximately 4 to 5 acres before needing to refuel (may vary depending on the yard type) and a 48-in cutting width, which means fewer passes. A high-back seat offers more support and comfort than traditional seats. It can be equipped with a system for mulching or bagging clippings, but these are sold separately. When it comes to maintaining your yard you will most likely need additional lawn tools to get small areas where a lawn mower cannot reach, regardless if it’s a walk-behind or riding mower. Areas like driveway edges, along fence-lines, flower beds, etc. usually remain untouched by even the best lawn mower and need the precision of an edger or trimmer. While it’s not entirely necessary, it does give your yard that finishing touch of a professional manicured lawn. Trimming: A trimmer typically uses a heavy nylon string that operates in a circular motion to cut the grass. Trimming is done using a horizontal cut to even the grass to the level of the rest of the lawn. Edging: An edger normally uses a perpendicular positioned metal blade that reciprocates. Edging is done using a vertical cut to the grass along boundaries such as the edge of the driveway or sidewalks. Trimmers and edgers are in a category of their own and come in several different variations from electric or gas powered, straight or curved shaft handles, and more. Some may come with different attachments. They also range in price starting at under $100 and up to $300 or more. Just as with lawn mowers, electric models are generally the least expensive. For a new homeowner with a small yard that is less than an acre in size, the additional cost of a trimmer and an edger to a lawn mower may not seem justified. A trimmer can actually pull double duty as an edger by turning it vertically to cut. While it won’t be exactly precise as with an edger, it comes very close and will save you from buying a separate piece of equipment. Very well engineered and affordable. Ideal for small yards. 3 tools in 1, easily converts from mower to trimmer to edger. The 6.5 amp motor provides maximum performance when trimming through the toughest weeds, grass and overgrowth. AUTOMATIC FEED SPOOL – AFS ensures continue work without bumping and having to stop to adjust the spool. Easy conversion wheeled edging- just rotate to convert from trimmer to edger. Gear Drive Transmission prevents bogging down in heavy grass and weeds. Lightweight ergonomic design with adjustable height and handle positions gives maximum comfort and control. This 3-in-1 trimmer/edger and mower combination can actually perform the work of 3 separate pieces of equipment in one compact, battery-powered machine for optimal efficiency. This 12-inch trimmer/edger/mower would be a great option for homeowners with an area of 1,200 square feet or less of land or for trimming around landscaped gardens. It features PowerDrive transmission so it can cut through thick, heavy overgrowth without bogging down.The Automatic Feed Spool gives you continuous use without bumping or having to interrupt your work to adjust the spool. The height deck and the trimmer can be adjusted as well as the pivoting handle for optimal versatility. This electric unit comes with two 20V MAX lithium-ion rechargeable batteries that have a longer lifespan than similar batteries for cordless convenience. There’s a foot pedal release on the mower base for fast and easy conversion between mowing and trimming/edging. When to Buy your Lawn Mower? Lawn mowers come in a range of prices, which can fluctuate throughout different seasons so keep an eye out for sales on the models that fit your needs best. May is generally the best time to shop around for great prices on a new mower as many retailers will offer sales before the peak season. Near the end of the season, towards September is another good time when you’ll likely find deep discounts on lawn equipment but the selection may be limited. What’s the Best Lawn Mower? No two lawns are exactly the same; likewise, there is no such thing as a one-size fits all lawn mower. Rest assured no matter the yard type, big or small, there is a mower specific to your needs. For homeowners that take pride in their lawn, this guide can help take some of the guesswork out of trying to figure out which mower type will work best. You need to consider a variety of factors and make a decision taking into account all of your needs (and budget). There is no single best lawn mower. We’ve written about several here that we feel are tried and true lawn mowers that have proven themselves to be both well-made and reliable. Surely, we can’t include every single lawn mower on the market. We do our best to provide you with options you’ll be happy with. If you try to find perfection in the products you buy and won’t settle until you’ve spent days and days researching then you’ll drive yourself crazy. The best decision is made when you purchase the first product that satisfies all of your main needs. Sure, there will always be another lawn mower, perhaps more powerful or more features, but is it truly better for you or simply a little different than the others. Save yourself from researching endlessly and spend the time enjoying your life. This is my philosophy when shopping for products. To learn more about the abundance of choice in our culture is leading to depression and stress, I highly recommend reading the book: Paradox of Choice by Barry Schwartz. An insightful book that will improve the quality of your life. I’m confident that reading this book will not only choose the best lawn mower quickly but also enhance the quality of your life and save you a lot of time that you would have probably wasted trying to find “the best” of anything.